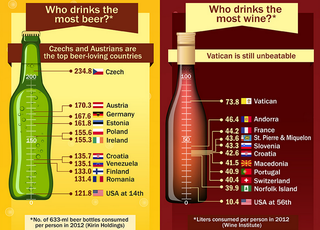 Who Drinks The Most Beer And Wine In The World? The smart folks over at CompareCamp made a fun (and super-huge!) infographic of beer and wine knowledge. Among the interesting facts: Europeans are some damn boozehounds! They're drinking circles around us, America. Of special note is the Vatican, which trounces the world in per capita wine consumption; according to the chart, the average Vaticanian (or whatever) drinks seven times as much wine as the average American. Anyway it's a cool infographic, and that bit up there is just a small part of it. Go check out the rest.